For hard of hearing individuals it can be difficult to properly hear what's going on in your home, which both makes life frustrating and can lead to some very serious problems. A great Lisa RX Pager bundle for hard of hearing individuals, the Lisa Alert System RX Pager Receiver Pack features everything you need to get a great pager experience from your Lisa alert system. The Lisa portable pager receives signals from any Lisa transmitter and will vibrate when it does, helping you stay aware of the things going on in your home. The pager can be held in a pocket or on a belt with the included belt clip, and will alert you as soon as the event happens. The pager charger makes it easier than ever for you to ensure that the pager has the juice it needs when you need it. Two rechargeable AAA batteries for the pager are inclued, helping to move away from wasteful and annoying disposable batteries. For maximum safety the charger features built-in protection against recharging alkaline batteries, helping you reduce the risk of a serious accident. At night, plug the pad into the pager and place the pad under your pillow. and when the pager is alerted the pad will vibrate, waking you up without disturbing others in the home. The strong vibrations ensure that you wake up quickly the second the pager is alerted. The Lisa pager system is fully expandable, enabling you to connect a range of different transmitters to alert for a range of different events in your home. 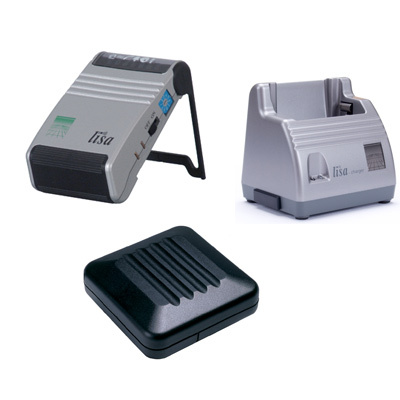 See the full Lisa pager system range for more. Please note: this listing does not include any Lisa transmitters, which must be bought separately.